This Las Vegas resort is a food-lover’s paradise, with a stupendous array of dining, in a variety of styles, cuisines, and indoor and al fresco settings. Fine dining begins with the fresh Mediterranean seafood created by much-awarded chef Paul Bartolotta. Enjoy it indoors or out in a private cabana surrounding the lagoon. Botero, named after the famous Columbian artist, serves wonderful steaks and seafood. Indoors or out. The Country club enjoys exceptional views of the unique Wynn Golf Course, and serves up innovative steakhouse fare for lunch and dinner. A Jazz Brunch is popular on Sundays.! At the Lakeside Seafood Restaurant, voted ‘best new restaurant’, you can eat from a speciality seafood menu whilst drinking in the views of the ‘Lake of Dreams’. There’s a nightly oyster ‘happy hour’. At Mizumi, chef Devin Hashimoto’s modern take on Japanese cuisine is best enjoyed al fresco at a private pagoda table. The setting is perfect, with views of the stunning private gardens, Koi pool and tinkling waterfall. Chef Theo Schoenegger’s tribute to ol’ blue eyes is called, of course, Sinatra. Like the man, it has oodles of style. SW Steakhouse has lovely views of the ‘Lake of Dreams’, and has been voted ‘Best Steakhouse in Las Vegas'. A newly-imagined bistro for breakfast, lunch and private events, Tableau puts a genuinely-imaginative twist on coast-to-coast American favourites. Wing Lei has been voted ‘Best Chinese Restaurant’, creating a rewarding mix of Cantonese, Shanghai and Szechwan flavours. It is the one-and-only Asian restaurant In North America to have a Michelin star. At The Buffet, voted ‘best buffet in Las Vegas’, there are 16 live-action cooking stations, serving up high-quality foods from across the world. The Drugstore Café is open day or night for everything from breakfast pastries and a wide range of speciality coffees, to sandwiches, salads and desserts. At La Cave, a wine and food hideaway is intimate inside or a little more public on the garden-inspired patio. Red 8 serves familiar Asian flavours from China, Thailand, India, Vietnam, Singapore and Korea. Society café puts a twist on the comfort food you love, and was voted ‘best new restaurant in America’. Sugar and Spice is full of sweet treats, and 18 flavours of gelato and sorbet. The Terrace Pointe Café is full of popular American dishes taken up a notch or three. Wazuzu does pan-Asian flavours superbly. Finally, at the Zoozacrackers Deli, you can enjoy New York-style deli eating. The menu ranges from Reuben Sandwiches to New England Clam Chowder. Try Zooza Benny, a really decadent breakfast dish. Vegans will be pleased to know that Encore at Wynn has teamed up with chef Tal Ronnen to create superb meat and dairy-free dishes, available day and night. 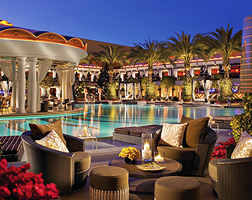 For bars and lounges, the Encore at Wynn offers numerous choices. Eastside is perfect for cocktails and has some very entertaining duelling pianos. The Encore lobby has comfy seats, refreshing cocktails and delicious appetisers. Parasols Up and Down are extremely colourful, with pleasing vistas of the ‘Lake of Dreams’. Finally, the Tower Suite Bar is another cocktail stop, serenaded by the melodies of the live pianist.